Dr Abbie Tipler talks about deadly tick paralysis, how it may affect your dog, signs to watch for and most importantly, how to prevent your dog from being a fatal statistic. Ticks are blood-feeding external parasites.They’re are often found in tall grass, plants and bushes, where they will wait to attach to a passing host such as your dog. On dogs, ticks will often latch on to fur, and then work their way in until they find a prime piece of exposed skin. When they find exposed skin they will use their cutting mandibles to cut the skin and insert their feeding tube to feed on blood. While there are several tick species which have been found on dogs in Australia, the paralysis tick (Ixodes Holocyclus) is the most health hazard for dogs and can cause death. Paralysis ticks in Australia tend to be more prevalent within around 20km of the Eastern Coastline. Your local vet will definitely know if you are in a tick paralysis prone area. Paralysis Ticks are more prevalent between around September and March in Australia when the weather is hotter. Tick Paralysis is a serious and sometimes fatal disease that is caused by the tick Idoxes Holocyclus injecting holocylcic toxin into a dog. This toxin affects the neuromusclular junctions which are essential for muscle function. 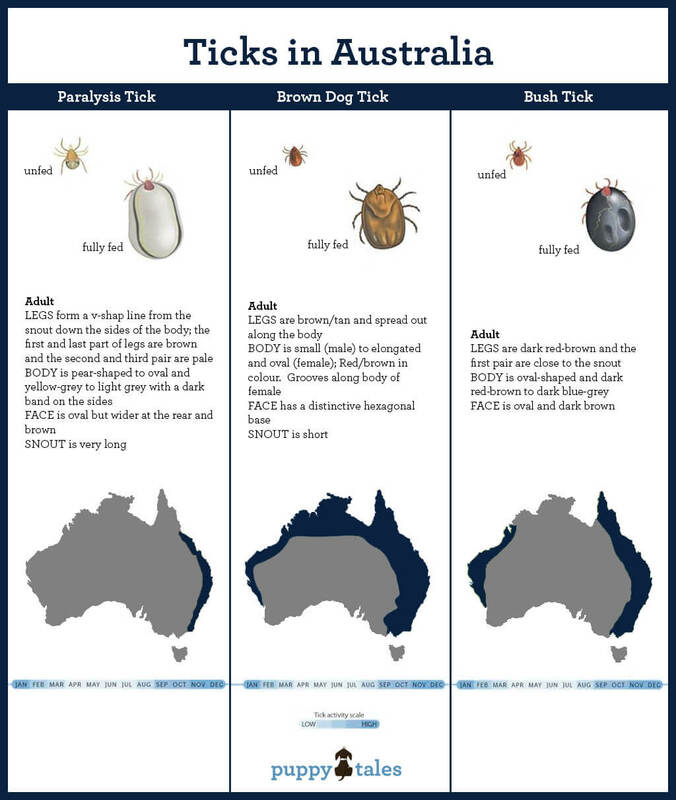 Below is a chart that will help you in identifying the Paralysis tick from other tick types commonly found on dogs in Australia. It also gives you an indication of the areas within Australia that these ticks are found. The most common place to find a tick on a dog is towards the front of its body. The mouth and ears are hotspots, as well the armpits of dogs and between the toes and paw pads. The paralysis toxin leads to muscle paralysis, which typically affects the hindlegs first, then is progressive to the forelegs, digestive and respiratory muscles. Overall this may lead to wobbliness, breathing difficulties, cough or grunt, difficulties swallowing and digesting food and excess salivation, retching and vomiting. You may not see all of these symptoms and often dogs initially present to the clinic just with weakness of the hind legs or just retching. Ticks are attracted to Carbon Dioxide which is produced by breathing, therefore 75% of ticks are found on the front legs and neck. Occasionally it can take multiple searches to find the offending tick! They can burrow deeply into the fur and often your vet will recommend a full body shave to rule out they have found every possible tick. This is very important (and can be life-saving). If your vet recommends shaving, don’t worry about the cosmetics – it may be life or death! Tick paralysis can be severe. Unfortunately, the tick antitoxin that is available to vets, only binds to any free toxin in the blood stream. It does nothing to the toxin that has already bound. This means that even after the tick anti-toxin has been given, the signs of tick paralysis can get worse. This means that 5% of cases are fatal regardless of treatment, usually due to respiratory compromise or aspiration pneumonia (where food is inhaled into the lungs due to dysfunction of the muscles controlling swallowing). Older dogs are often more severely affected. We recommend to fully shave all patients. Even if we find one tick, it is possible there is a second or a third hiding in the fur. We sedate dogs before clipping as it is very important that they don’t become too agitated! Keeping dogs affected with tick paralysis relaxed, and not using their muscles, is very important. We give tick antiserum at a dose of 1ml/kg over 30-60 minutes (diluted to half strength). We apply frontline and bath the dog in a permethrin. We put viscotears in the eyes every few hours as tick paralysis can also affect the blink reflex. We give maintenance fluids intravenously because patients need to be nil by mouth until it is safe to feed them (because of the risk of aspirating the food). We monitor ventilation with blood gases if needed and in more severe cases. Very severe cases occasionally need to be put on a ventilator to control breathing. Cases of aspiration pneumonia are additionally treated with antibiotics. All patients are carefully monitored by the nursing team to ensure they are kept in a sternal position (lying on their fronts), that they are calm, that vitals are continually monitored, that padded bedding is provided to reduce any risk of pressure sores and that urination is monitored. Treatment can cost anywhere from around $1000 upwards! A severe case that we referred to the specialist centre had a total bill of over $20,000! The purpose of educating people about the potential costs, is to point out that prevention is not only better for your dog, but better for your pocket! There are a few main options for prevention: New on the market are monthly chewable tablets that cover for fleas and ticks with excellent effectiveness. The one we sell is Nexguard, a palatable chew. It is dog only. Frontline and Advantix are topical spot ons that also treat for fleas and ticks (note that advantix is very toxic to cats). The disadvantage with these products is they have to be applied every 2 weeks and they can wash off if your dog swims a lot. Then there are tick collars, such as Scalibor. These don’t work instantly, often taking a couple of weeks to take effect. Swimming can also alter their effectiveness. This is the most common reason for not treating for ticks, however if you are in a tick-prone area, it is very dangerous to think that if your dog has never had a tick that they won’t get one. In fact, in my experience, it is these very dogs that have had little exposure to ticks that are often the worst affected by paralysis when a tick attaches. Owners often say to me ‘I wish I had kept up with my prevention’. ‘Given my dog has never had a tick, is the risk of using ‘toxic’ medications not greater than the risk of tick paralysis’? If your dog is affected by tick paralysis, there is a 5% chance they will die. As far as I know, no dog has died as a result of using tick prevention, nor has it affected a dogs lifespan. Furthermore, tick antiserum (which is lifesaving and therefore essential) has many more dangerous side effects than any tick prevention. There is a risk of anaphylaxis when using tick antiserum. Tick paralysis is also stressful and unpleasant for dogs, even if they do survive. For all of the above reasons, this is a clear case of ‘PREVENTION IS BETTER THAN CURE’. 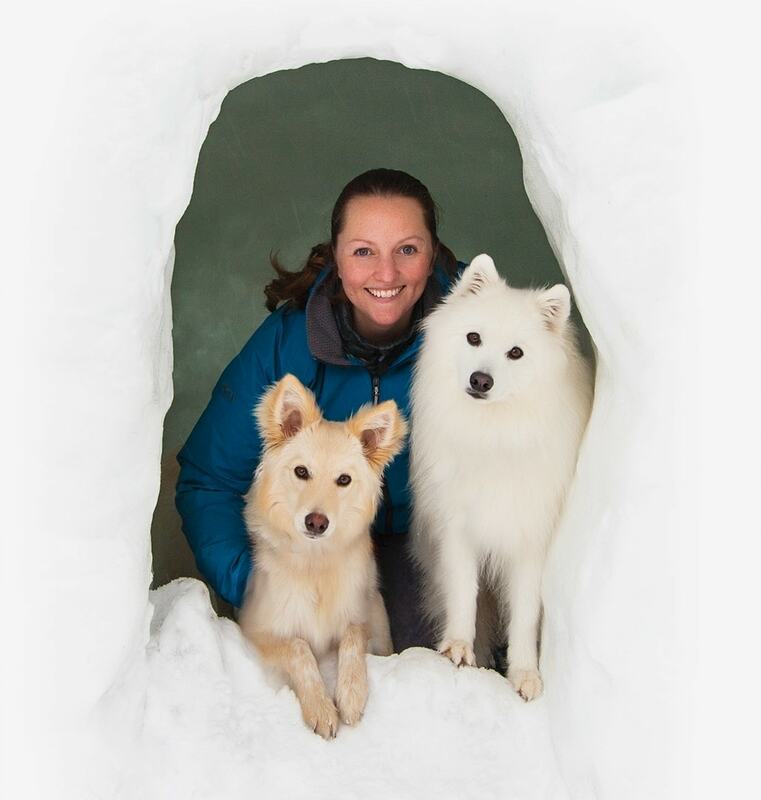 Dr Abbie is a Small Animal Veterinarian with 10 years full-time experience. Her passion is Small Animal Surgery and in 2011 she studied towards and obtained her Memberships in Small Animal Surgery from the Australian College of Veterinary Scientists. 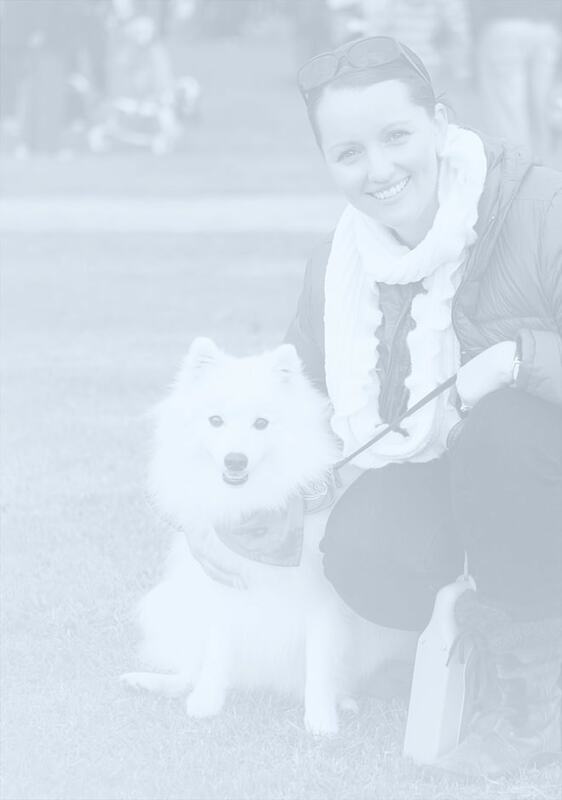 Although surgery is her special interest, she loves all aspects of General Practice, especially canine medicine. She lives with her family and two Ragdoll cats.